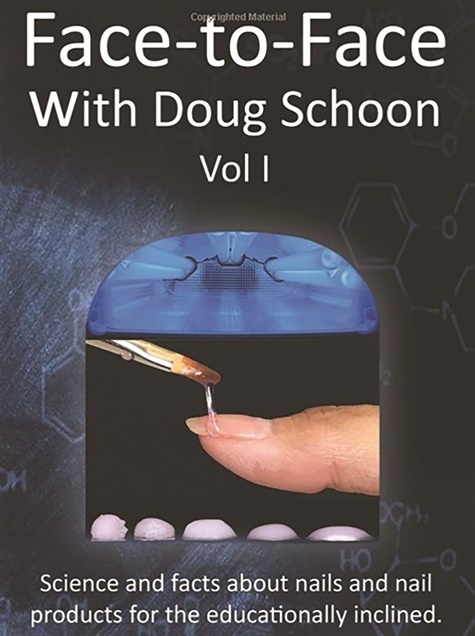 How many of you have Doug Schoon’s current book “Face to Face, Volume 1” in your possession? Isn’t it an amazing resource of science and #nailtruth that makes you feel smarter with every page!? Here is an excerpt from Volume 2, which I am in the process of editing. I thought it would be helpful with all those winter pedicures where polish is kept on longer than usual, making us think we’re seeing dehydration. Enjoy! What is the fuzzy white stuff on the surface of the nail plate after I remove nail polish from my client’s toenails? It started on one toe and now other toes have these same spots. They file off easily, so I don’t think it is surface damage and they don’t go away when the nail plate is wet, so I don’t think this is surface dehydration. I agree, this doesn’t sound like surface damage or dehydration. Surface dehydration is quickly reversed when water is applied. There is another possibility that should be considered. This could be a type of fungal infection called WSO, which stands for White Superficial Onychomycosis. W for White, but these can be a greyish color as well. S for Superficial, meaning it grows on the surface of the plate. O for Onychomycosis, which is the medical term for any type of fungal nail infection. About 10% of all fungal infections of the nails are considered to be WSO. WSO is an infection of the surface of the nail plate that can be caused by one of three or four different types of fungal organisms. Typically, these organisms infect the upper surface of the nail plate, and have the appearance of white patches or islands. The plate can look like it is covered with white speckles or powdery-looking patches, spots, or streaks that appear on the surface of the nail plate. WSO can become more powdery as the infection worsens. If they go untreated, these organisms can infect deeper layers of the nail plate. As the condition advances, the nail plate will become rough and crumble easily. The surface of the nail plate may take on a brownish or grayish surface. Since children’s nails are thinner, they can infect the entire thickness of the nail plate. The fuzzy appearance that creates the whitish layer can sometimes be easily filed away, but if this file is not properly cleaned and disinfected, the infection can be transmitted to other nails. These infections are most often seen on feet, rather than hands since like other fungal organisms they prefer to grow in warm, moist environments. They are sometimes seen growing under nail polish and are frequently mistaken for dehydration which results in them being uncategorized as so-called “nail granulations.” But this makes no sense. Nail polish doesn’t dehydrate the nail plate; in fact it does the opposite. Wearing nail polish increases the moisture content of the nail plate from about 15% water to 20% water content. That 5% increase in water content of the nail plate makes it easier for these organisms to grow. Because these infections are usually restricted to the surface of the nail plate, they can be easier for medical professionals to treat. However, if ignored these organisms can infect deeper layers of the plate which can make these infections more difficult to get rid of, so if you suspect your client has a WSO infection, send them to a medical professional for a proper diagnosis, and treatment if required. If you haven’t acquired Volume 1 yet, it is not too late to treat yourself to a copy, ending the year with an investment in your business!